Heal all friendly creatures in a lane, then give them all +1/+1. Plea to Kynareth is a rare Endurance action card. It is part of the Core Set. In addition to the card's availability in the Core Set, one copy is obtainable in the Black Marsh Smugglers deck as a potential reward from The Restless Dead. 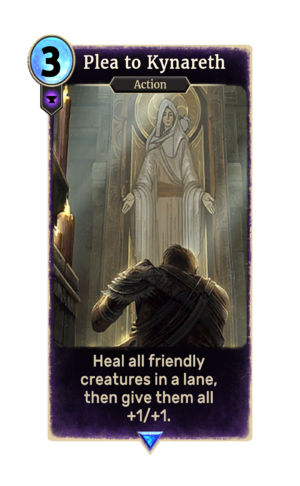 This card's ability applies the Kynareth's Light card effect. It is unknown what the card's audio is meant to represent. The card is named for Kynareth, one of the Eight Divines.